And here in Israel, we’re doing just fine. Really. Last night in my city – one the world knows largely only for the controversy over our existence, we did something amazing. Quiet but so amazing. It started weeks ago. Actually, it started years ago. The brilliant idea of a dear friend who moved to Israel a few years ago, the first event was held in my back yard and raised about $1,000 for charity. But the idea exploded – yeah, ideas can do that and this one did. So twice a year, with great anticipation and tremendous help from dozens of volunteers, we’ve been hosting this event in Maale Adumim and last night we did it again. It is, I think, more important than the Pope coming, more important than the fact that Olmert will be sentenced to go to jail this morning for all sorts of things he did. It’s actually more important than the peace process…because we all know there isn’t one and for all that Abbas and Kerry are talking in London, that dance won’t work any better than Kerry’s other ideas. So let me tell you about Israel in a nutshell, because that’s what the last two days and nights in my city was all about. A few weeks ago, we began announcing, to great anticipation – that May 11 and 12th were the days. One synagogue donated its social hall – without question or hesitation for three nights – one to prepare, two to host. On May 1, people began bringing boxes and bags and parcels to my house. Some knocked on my door; others just left them there. My friend Rivkah did the hard job – tracking thousands and thousands (total over 5,500) books…all in English. Best-sellers, classics, you name it – we got it. 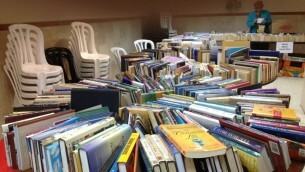 From Beit Shemesh, Shilo, Efrat, and Jerusalem, people donated. Someone who couldn’t give books, offered money. 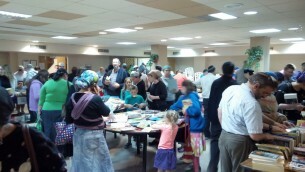 Then, Saturday night, the volunteers swarmed in and shlepped the books to the social hall. And Sunday afternoon more volunteers came and organized the books – amid fun and laughter. They di dn’t take my suggestion that Obama’s book be placed on the fiction table but I have great satisfaction knowing no one thought it worth even a dollar. In the last minutes, someone paid 30 cents for it, knowing the money was going to charity. We filled more than a dozen tables, with full boxes of reserves below. 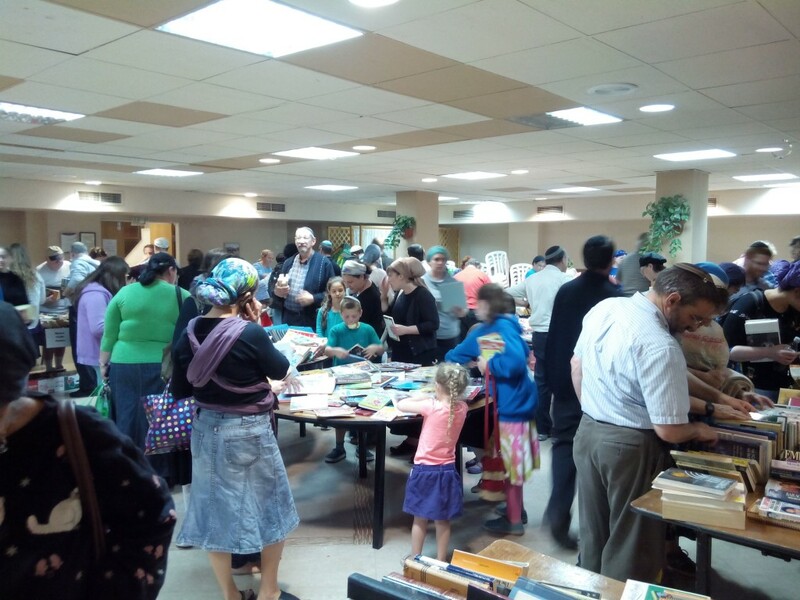 On Sunday night, people were waiting at the door – the 7th Maale Adumim Great Book Swap was underway. For the next two hours (three really), people laughed, talked, selected, collected. All for 5-10 shekels a book. Children were as excited as adults – maybe even more so. And as people paid with a smile to more volunteers, they thanked us and congratulated us. Still more volunteers helped us re-arrange the books and knock down a few tables that had been emptied after the purchase of probably close to half of what we’d put out. But still, all those best sellers were well represented – and another night to go. And last night, they came again – as with the first night, they came from all over Maale Adumim – but from many other places in Israel as well. When it was time to clean up the much depleted reserves, there were more volunteers to move the remaining books. We’re talking about getting an outdoor shed so that I can clear my steps (I’m hoping Keter or some other company will volunteer to donate a small outdoor shed for storage as a sign that they too value Israel’s endless efforts to help others). All told, we raised…in two nights, just under 12,000 shekels (about $3,450 at today’s exchange rate). Six months ago, it was just over 10,000 shekels. Each time, a bit more, a bit better. Even when I think we can’t possibly raise more or handle more books, my friends and community prove me wrong. I have to admit there were unexpected tears in my eyes at the end of the night – what an amazing thing to do I kept thinking. Just wow…and then I realized that the “we” that had accomplished it encompassed hundreds of Israelis. They came, they donated, they organized, they purchased and then they didn’t leave until all the work was done. The money will go to four amazing charities – to help those in need, to help those who are orphaned, to help those getting married, to help those who are very sick. This morning I came to work and read the news as I always do and realized that all those newspapers and all those websites were wrong. They’d missed the most spectacular news of all. Last night, Israelis did what they do every day – they took care of themselves and their neighbors. They opened their hearts (and their wallets). Oh, we’ll be seeing them much more often than that – they are our neighbors and friends – but they know now, that in six months, they’ll be back there in this hall buying more books, knowing that more charities will be benefiting. And six months after that, and six months after that. No matter what happens in Syria or London, China, Vietnam, Washington or Vancouver…we’ll be here in six months and six months, and six months after that. And not only will we be here, we’ll continue thinking of those in need and we’ll continue helping as we can because ultimately, what the media misses, is that this is what Israel is all about.